When a customer has gone through the process of finding your store, locating the product they want, and navigating to the checkout, it’s frustrating when that’s as far as they go. But it happens a lot. Seventy percent of online orders are abandoned. 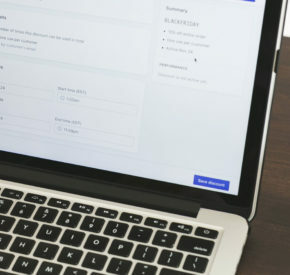 If nearly three out of four customers are abandoning their shopping carts at the final step of the process, finding ways to get them back to your site to complete their order is a pivotal part of your eCommerce strategy. Any way you can close those sales will increase revenue—even by giving up some of that revenue with a coupon code. Adding a discount to your recovery campaign helps you tip hesitant customers toward purchase. While you might feel like discounts for already lukewarm customers give away too much, our data shows that they work. We looked at 275,045 discounts attached to recovery emails. Not all of those led to recovery, but the ones that have—over 12,000 of them—produced $2,456,852.79 in attributable revenue. That works out to over $200 in recovered revenue per discount used. Discounts are clearly working for the stores that use them, and we wanted to better understand how they were being used. Below is a closer look at the data and what you can learn from it for your store. The trends we identified in discounting behavior and effectiveness can help you better deploy discounts in your store, whether you’re using them already or thinking about adding a coupon to one of your emails. Choosing a discount that maximizes recovery rate while minimizing lost revenue is critical. When you’re considering a discount, it’s always important to run a cost-benefit analysis and find out exactly how a discount will affect your bottom line. While shipping costs are one of the most common reasons customers abandon their shopping carts, this type of discount is the least utilized of the three types. Only 7.2 percent of abandoned cart recovery campaigns with a discount used a free shipping discount. The sample size here is relatively small (remember, this is the least utilized discount option), but the patterns seem clear. Free shipping is used almost exclusively by stores with ACVs of $20-$40. Why is this the sweet spot for a free shipping discount offer? Below these values, shipping costs are likely minimal for smaller items, and so not a good motivator, or margins are so thin that free shipping can’t be profitably offered. Some low cart value stores also offer free shipping as a matter of course but bake it into the item price. Above this range, a) customers understand that shipping is an unavoidable factor for larger items, or b) stores are more likely to already offer that discount before or during the checkout process (e.g., “free shipping on all orders over $50”). In the $20-$40 range, the abandoned carts likely haven’t hit the cutoff for free shipping during checkout, but an item costing that much can still incur significant shipping costs for the customer—enough that they might abandon their cart during checkout and later be persuaded by a free shipping discount via a recovery email. If your ACV is in this range, consider how your customers might perceive shipping costs and whether a free shipping discount in your abandonment campaign could help convert at least a few more customers. For the highest average cart value stores, almost 95 percent of all revenue recovered using percentage discounts is recovered with a 5 percent discount. This makes sense when thinking about the potential profit loss on higher-priced items. With ACVs in the multiple hundreds, the higher-level discounts relate to high levels of revenue. If you are selling a $500 item, the difference between a 5 percent discount and a 10 percent discount is $25, which is a significant amount to lose. This is why it’s important to analyze how these discounts will impact your store directly. That makes it easier to find the type of discount that gives you the most return on your investment. At the other end of the scale, the most popular discount percentage is shifted up. For ACVs of $0-$100, a 10 percent discount is most commonly used, but can easily go as high as 20 percent. For an ACV of $100-$150, the most common discount percentage is 10 percent as well, but generally only shifts up as high as 15 percent; we didn’t see the 20 percent discount used at all. These low and mid-range ACV stores also rarely use the 5 percent discount. In stores with an ACV between $150-$200, you start to see the 5 percent discount used much more. There are still some 10 percent discounts being offered at that level, but it is drastically diminished from the $100-$150 tier. Once ACV rises above $200, the only discount that is really used is 5 percent. There are certainly a few outliers, but the vast majority of stores at this level will only offer a 5 percent discount and nothing higher. Understanding how these numbers affect your customer is the first step in building a better recovery email campaign. The smaller your ACV, the higher you can push a discount. A 20 percent discount on $20 is only $4, where a 20 percent discount on $250 is $50. Depending on margins and cost of goods sold (COGS), smaller eCommerce sellers can potentially discount at higher percentages without as much lost revenue. In many ways, it comes down to customer psychology—bigger dollar figures are more enticing even if the percentage off is actually lower. If you are selling higher-priced items, you need less of a lure to get people back. Twenty-five dollars off a $500 item feels like a substantial savings even if it isn’t a huge percentage. With that in mind, trying to maximize the perceived impact of your discounts while also keeping percentages down makes the most sense. While some stores are using higher discounts with decent recovery rates, the increase doesn’t actually help them in the long run. Using a 25 percent discount is still relatively effective at recovering carts, but less so than a 10 percent coupon. And, of course, higher discounts cost more in real dollars, as well. From both a usage and recovery rate perspective, a 10 percent discount seems to be the ideal starting point for this level of ACV. For stores with ACVs of $50-$100, the sweet spot for recovery rate was 12 percent and for stores with an ACV within the $100-$150 range, again the best recovery rate was seen with a 10 percent discount. This indicates that there are diminishing returns for higher discounts. While a change in recovery rate a couple tenths of a percentage might mean losing (or gaining) just a couple of sales, higher discounts mean less money recovered. It usually doesn’t pay to go above 10 percent for most stores with small to mid-range ACVs. Note that for average cart values above $200 there were no 12 percent or 25 percent discounts present in our data set. 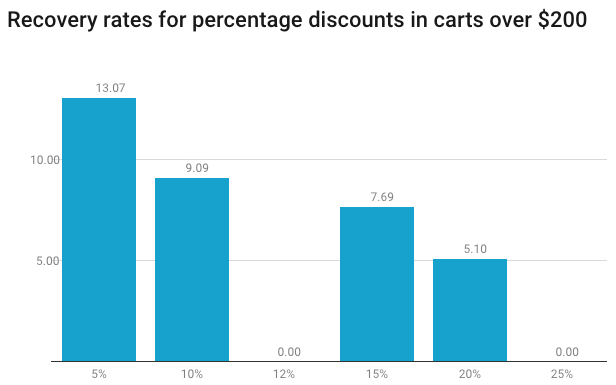 This shows that while percentage discounts were the most popular for Jilt users, it still requires some analysis to find the right fit solution for your store. 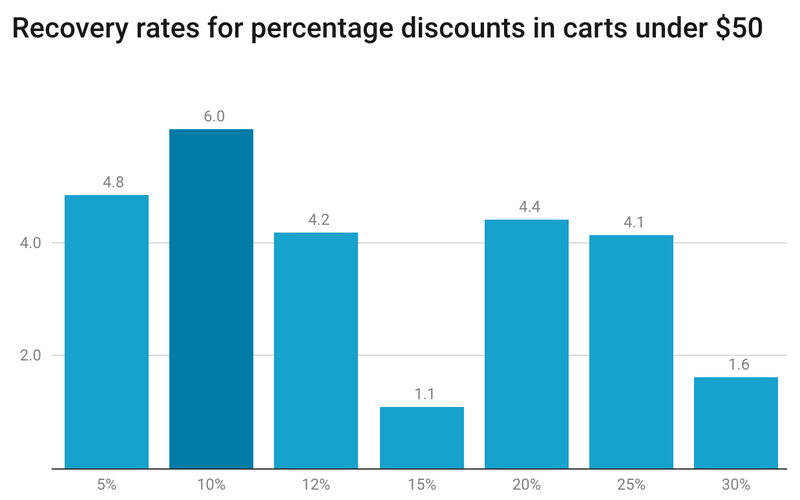 If you’re offering a discount that is too high, it may still be recovering some carts, but would a smaller discount have the same effect, or even a better one? As you consider a discounting strategy for your store, it will be beneficial to start out with the most common types of discounts we’ve talked about today and test others to learn more about your specific customer. These numbers represent a large number of stores in aggregate, but individual shops may see differences. When using a fixed or percentage discount, you need to make sure that the amount is in line with the customer’s expectation of a deal. Offering too high a discount devalues the store brand, and offering too low a discount will likely not be as successful at converting the customer. It’s easy to see that percentage discounts are the winner; they convert more often and recover more revenue. We found that percentage discounts also had the best overall recovery rate at 3.72 percent. That was followed by fixed discounts at 2.28 percent and finally—shipping discounts at a measly 0.4 percent. While shipping and fixed discounts weren’t utilized as often, this data still shows an advantage for percentage discounts. If you’re thinking about including discount coupons in your recovery-email campaigns, percentage discounts are your best bet for getting started. They not only recover the most revenue by a long shot, they also tend to recover the most carts than the other two types of discounts combined. Of course, some stores will be outliers. If your store ships very large or very heavy items that have higher-than-normal shipping costs, shipping discounts may be more effective. It pays to experiment with different types of discounts to determine which work best for your customers. In terms of total revenue recovered, percentage discounts were the most successful. But if you are trying to recover revenue quicker, a fixed discount may actually be the better option. Removing any outliers and limiting our analysis to abandoned carts that have been recovered within one year, we see that the offer of a coupon or discount helps decrease the time between abandonment and recovery. Fixed discounts resulted in a recovery time that was 2.86X faster than no coupon. Shipping discounts resulted in a recovery time that was 1.91X faster than no coupon. Percentage discounts resulted in a recovery time that was 1.23X faster than no coupon. This makes sense when you think about the nature of discounts and coupons. They’re usually time-sensitive, so customers need to use the coupon before it becomes invalid. If you want to drive customers to recover their carts faster, time-sensitive coupons and discounts will increase the sense of urgency: Buy now or you’ll miss out. Fixed discounts show three peaks, one after a day, one at 10 days, and another at 2 weeks. Shipping discounts show a peak after 48 hours. Percentage discounts show an initial peak on the first day, then a second one after 24 hours. The gray in the chart above is all the carts recovered without a discount. These far outnumber the discounted recovered carts. At first glance, it looks like not offering a discount wins out, with a massive peak of recovery within the first few days. This indicates recovery emails work, even without a discount. But there are also a significant amount of carts recovered long after this first week. This makes the median time to recovery for non-discounted carts longer. There are still hundreds of carts being recovered up to two months after they were abandoned. These peaks can be associated with the recovery campaigns, but that will eventually dwindle, showing a tail that continues for years. While the revenue is still being recovered, on these very long timelines, it’s difficult to say whether the recovery campaign was a success or someone just came back to make a purchase years later. When you use discount coupons in your recovery campaigns, it helps shift the time to recovery closer to the original abandonment date, recovering that revenue much faster. It also helps you better track the efficacy of your recovery campaigns. Being able to see recovery rates within days rather than months provides a clearer picture that can help optimize these campaigns further down the road and unique coupon codes let you track specific campaigns more easily. Digging through the data, the first thing we noticed was this: Recovery emails work. In 2017 alone, Jilt customers were able to recover almost $6,000,000 in revenue through abandoned cart recovery email campaigns. That’s a huge win for what is typically just a series of three emails. Simply reminding a customer that their potential purchase is waiting helped bring them back to the cart eventually. I’ve recently removed the coupon code option at checkout on my site. Someone recently posted on Twitter and that if you are getting abandoned carts and have a coupon code space at your checkout one concern is customers might Google your company name, or product with the word coupon or discount to hunt for a savings. That can then lead to the customer seeing the product offered elsewhere at a lower price and the customer jumping over and making the purchase…not at your site. There are other ways, with memberships and such for customers, to offer a discount to a loyal customer that doesn’t require the possible loss of a sale as described. Heya Mark, this is a great point! Keeping discounts exclusive can definitely help reduce abandonment for many stores — I’ve also seen retailers link to a coupon or sale page on their site next to coupon code fields as well (like Macy’s), which often helps keep customers on-site instead of leaving to discount hunt. If you’re using WooCommerce, you can pretty easily hide coupon code fields, and fortunately, Jilt can still apply coupons via recovery URLs even if those discount inputs are hidden. :) So hiding coupon fields a bit on your site can be really useful in conjunction with offering them in select instances, like in recovery emails, if you’re open to discounting. Absolutely worth an AB test for most stores! I’ve been exploring pricing a lot and as you know there are lots of opinions on what is best. I’ve hesitated to offer a coupon with an abandoned cart knowing some will just use that as a way to always get a savings. I don’t think, for us, it’s best to deal with those seeking to save a buck on every order. I know for some businesses it might be an ideal way to capture that lost sale. I’ve hesitated to offer a coupon with an abandoned cart knowing some will just use that as a way to always get a savings. I don’t think, for us, it’s best to deal with those seeking to save a buck on every order. Thanks for writing this and for running this analysis. Very insightful. How did 275k of recovery emails *without” discounts attached fair? I know this still wouldn’t be a perfect A/B, as there are so many variables that should be matched – but maybe it’d still offer a useful perspective. I know this might be asking a lot since I understand you’ve already provided a lot of great info here, which I appreciate. But I’ve chosen to not offer discounts in my Jilt follow up emails because I’ve always been unsure, and because I wonder sometimes if “word gets out” amongst the customer-base that if you leave an item in the cart you’ll get a discount a day later (I know this is a separate issue, probably only applicable to businesses that have customer bases that are chatty on social media). Hey Kyle, nice eagle eyes here, having the set of emails without a discount was definitely an interesting foil for us. We didn’t go into a lot of detail here because we saved that for an upcoming post. ;) We’ll be publishing a comparison of how discounts affect revenue and conversion rates overall, we wanted to devote some more time to that analysis. In the meantime, though: I agree that discounts can influence behavior, and you don’t want to encourage abandonment with discounts (especially with chatty customers or an engaged community!). We typically recommend that you consider segmenting your recovery campaigns to only include discounts in certain cases: if the order count for the customer is less than one or greater than 2 (so you catch only first-time customers or loyal ones), or if the order total is above a specific amount (so you don’t discount lower value orders). This research is incredibly helpful thanks. It’s fantastic that Jilt collate this information and share it, for the benefit of all their customers. I’m pleased to read that we are already offering the optimal discount for our price points!